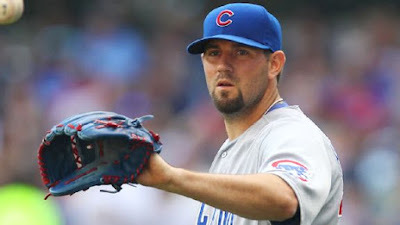 What Happened: Jason Hammel happened. 6 IP, 1 ER, 6 K's and a base hit that scored both of the Cubs runs. Hammel got the job done in all facets of the game. He is your Player of the Game. Also Good, But Some Hits Would Be Nice Too: For the second night in a row, Jason Heyward made some spectacular plays in the field to keep the Cubs in the lead. Last night it was his throw home in the bottom of the fourth that got Hammel out of a second and third with one out situation. Now if he could just hit the goddamn ball every once in a while, things would really be great. Same Goes For You Other Slackers: I'm looking at you, everyone except Fowler and MIGMON. And our starting pitchers, apparently. Thing To Keep In Mind: The Cubs haven't started hitting like they have the potential to and we're still 11-3 and just took the first two games against the Cardinals the first time we've faced them since breaking their spirit in last year's NLDS. The starting pitching has picked things up big time and the bullpen has been phenomenal. Imagine how well we'll be doing once the bats heat up too. At this point last year, the Cubs were 8-6. The Cubs finish up their series with the Cardinals today at 12:45. The Cubs will start Kyle Hendricks and the Cardinals will counter with Carlos Martinez.